Are you looking for something very particular for your game? 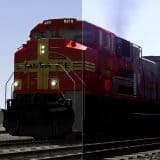 Then you may find it in our Trainz Railroad Simulator 2019 Other Addons category. We provide our visitors with the newest Trainz Railroad Simulator 2019 Other Mods, which improve their game vastly. People like these extra features because it is so easy to add them – you simply need to click on Trainz Railroad Simulator 2019 Other Addons download button. As there are no payments or other restrictions, everyone is able to enjoy Trainz Railroad Simulator 2019 Other Mods free examples to the fullest. Improve your score and experience more adventures with TRS 2019 Other Addons. It’s amazing, how much useful options these TRS 2019 Other Mods can provide you. Don’t hesitate, it’s your time to outrun all the opponents. These additional files will surprise you – don’t miss this opportunity. Play smart and you will go far. Accomplish your goals much faster and be successful!